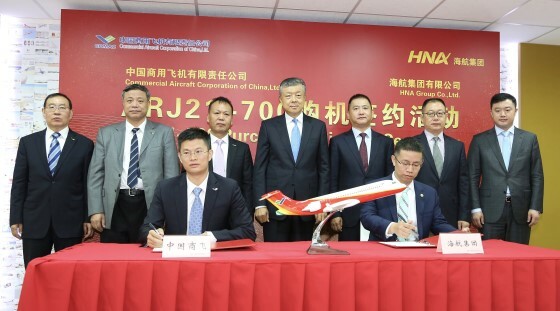 COMAC signs LOI of 20 ARJ21-700 aircraft with HNA Group__Commercial Aircraft Corporation of China, Ltd.
Commercial Aircraft Corporation of China, Ltd. (COMAC) signed a Letter of Intent (LOI) of 20 ARJ21-700 aircraft with HNA Group Co., Ltd. at the 51st Farnborough International Airshow on July 16th, 2018. This is the first implementation result of the framework strategic cooperation agreement between COMAC and HNA Group signed in Shanghai in early June this year. It is reported that the 20 ARJ21-700 aircraft would be operated by Urumqi Air of HNA Group after their introduction. Urumqi Air of HNA Group has become the 22nd ARJ21-700 customer. A total of 473 ARJ21 orders have been obtained. Mr. Liu Xiaoming, Chinese Ambassador to UK, Mr. Zhao Yuerang, President of COMAC, Mr. Zhao Quan, Director of HNA Group and Chairman & CEO of HNA Tourism Group, and Mr. Bao Qifa, Chairman of Hainan Airlines, attended the signing ceremony. Mr. Zhao Yuerang extended gratitude to HNA Group for their long-term support to COMAC in the research and development of aircraft programs. He expressed that HNA Group had been one of the most important partners and customers of COMAC, COMAC had signed a Framework Strategic Cooperation Agreement with HNA Group earlier, and this signing would further deepen the cooperation between both sides. COMAC would work with domestic and foreign customers like HNA Group and Urumqi Air to jointly promote the market-oriented and large-scale operation of China-made civil aircraft. Mr. Zhao Quan expressed that HNA Group had been committed to becoming an important participant and major force in building China into a civil aviation giant, and was willing to make contributions to letting China-made aircraft soar in the sky and reach out to the world. Signing agreement with COMAC to purchase the modern jet designed and manufactured by China was an important decision for Urumqi Air to accelerate its business development. It was believed that ARJ21-700 aircraft would open up broader way for the business development of Urumqi Air, and assist HNA Group in building an air bridge for "The Belt and Road Initiative". Over the past 25 years, HNA Group has consistently focused on high-quality development of its main business in airline industry, and actively expanded the upstream and downstream industrial chain. It has developed from a pure local air transport enterprise to an enterprise involving in the whole aviation industrial chain which covers air passenger and cargo transport, aircraft maintenance, ground service, flight personnel training, airline food and other services. As the main operator of the newly introduced passenger jets, Urumqi Air of HNA Group is the only local airline in Xinjiang at present, which has operated 13 aircraft among 30 cities, accumulated more than 90,000 flight hours safely, and accumulatively carried more than 5 million passengers. The punctuality rate of Urumqi Air has ranked first among the major airlines in Xinjiang for three consecutive years, and a route network structure taking Urumchi Diwopu International Airport as the center and radiating throughout major cities in China has been basically formed.